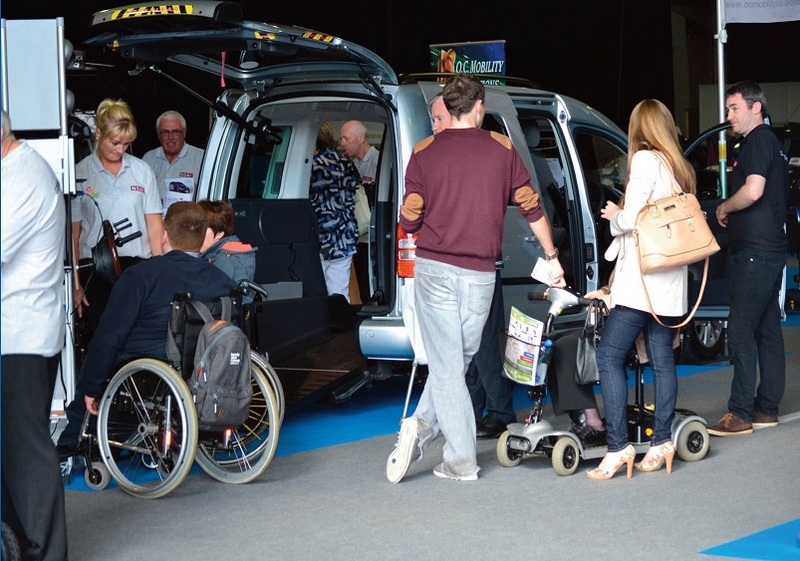 At the recent Disabled Drivers Motor Show & Conference 2016 in Dublin, there were a range of companies showing interesting products that would make you believe that driving is open to much more people that you may think. Driving your own car does have its benefits. The main one being that you have reliable transportation to get to your job, school or to do other various activities. You will also have space to hold your items and will be protected from the weather. For anyone with a disability or drivers who are experiencing changes in their vision, flexibility, strength, or range of motion there are various alterations that you can make that will optimize your driving performance and safety. Anyone looking to add adaptive vehicle devices to their vehicle will benefit from a driving assessment. Typically an occupational therapist will recommend equipment and a Vehicle Adaptor. 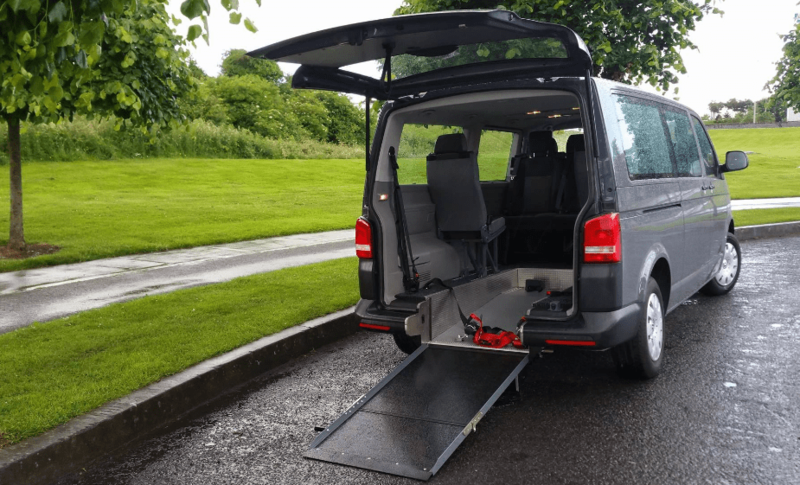 The Disabled Drivers Association of Ireland (DDAI) and the Irish Wheelchair Association both provide useful Information for choosing the right vehicle, the Irish Tax relief scheme, and Adaptations & Equipment that can be obtained. Choosing the right vehicle is important as small differences in the shape and size of such things as doors or seats can make a big difference to how easy it is to get in and out of a particular car. The Drivers and Passengers with Disabilities – Tax relief scheme are open to persons who meet the specified medical criteria. Relief in respect of Vehicle Registration Tax (VRT) and Value Added Tax (VAT) may be obtained. People may require their vehicles to be modified in order for them to drive or to be carried as a passenger. Adaptations can be made to a vehicle to meet the needs of drivers and passengers with disabilities. 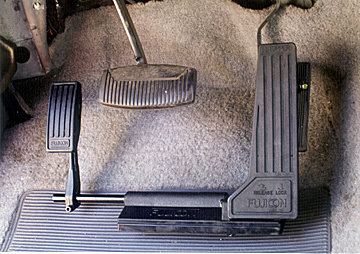 Hand controls for accelerator and brake. There are a range of hand controls to suit the needs of the driver. Such as standard push pull hand controls radial hand controls and the carospeed hand controls which can incorporate the auxiliary switches and cruise control. The Brig-Ayd Electric Trigger Throttle and Brake Hand control is a push/pull hand control system. It allows users to control the throttle via a trigger incorporated in the handle of the controls, with just a few grams of force. The brake is operated by pushing the handle down; this gives light and responsive control of the vehicles brakes. This Guidosimplex Long Arm Brake Lever allows the driver to apply breaks to the vehicle. Manufactured from aluminium and coated with embossed rubber, the brake lever is also fitted with buttons which activate both the horn and a locking system. The Guidosimplex Over Ring provides a light acceleration control. The accelerator ring can be fitted to most vehicles. 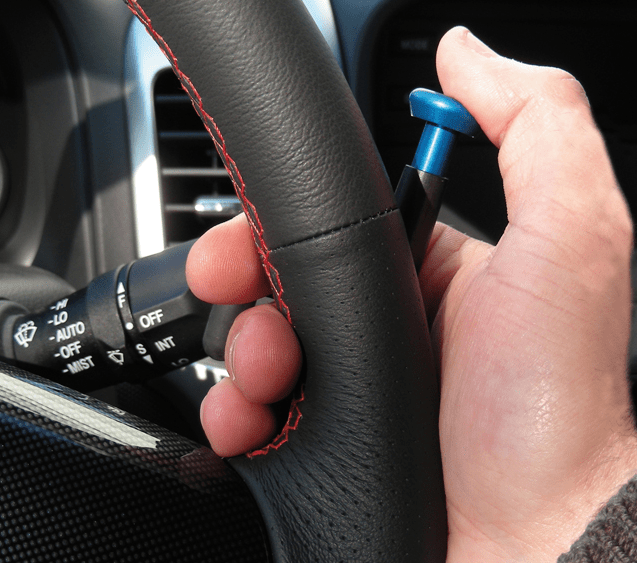 A simple push to accelerate, allows both hands to be kept on the steering wheel while driving. Quick Release version also available. Does not compromise steering wheel airbag. Also an under ring version mounted directly underneath the steering well. This solution allows the end user to accelerate by simply performing a rotary movement (Clockwise and/or Anticlockwise) whilst keeping both hands on the steering wheel. The Guidosimplex Satellite provides another option for vehicle acceleration. It is suitable to be fitted to most vehicles and is offered in either fully electronic or electro-mechanical versions. 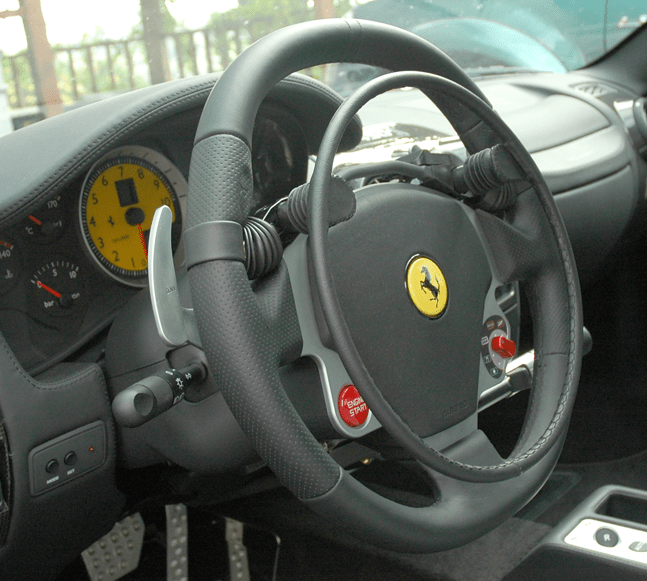 Since the unit is hand-held, all functions, such as air bag and secondary controls mounted on the steering wheel, are retained for use. The power to the Satellite accelerator is also cut when the brake is applied. 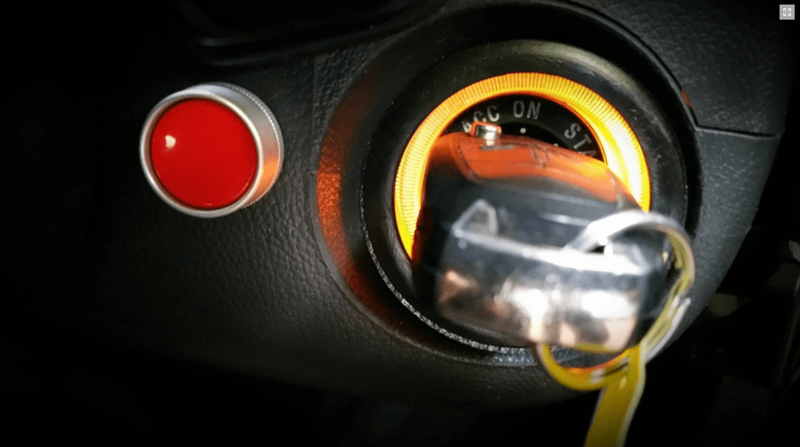 Not every Car model comes with Push Button Technology so for drivers who may find it difficult to use an engine key start, this simple push button start facility can be fitted. 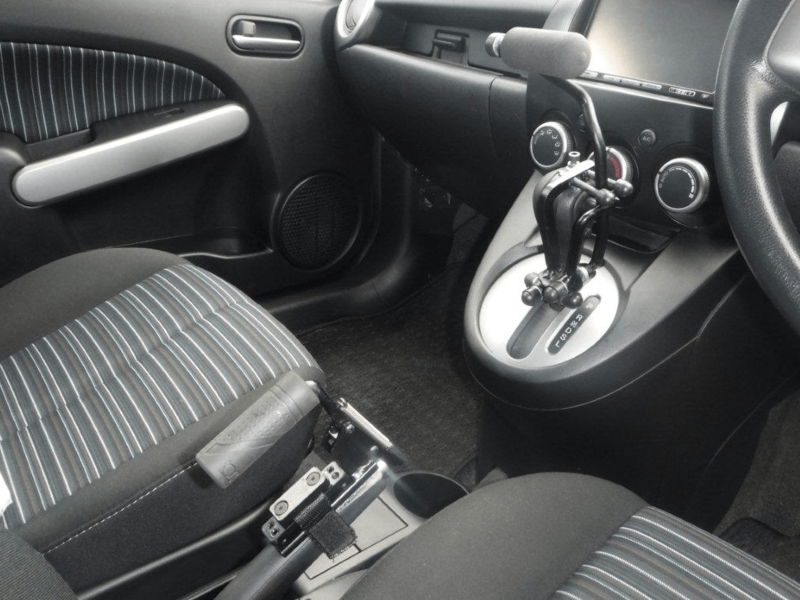 For assistance selecting Drive, Park or Reverse with an Automatic Gear Shifter, then a personalized modification to suit a particular needs can be fitted. There is a wide range of steering aids to suit all vehicles and also the needs of the driver. 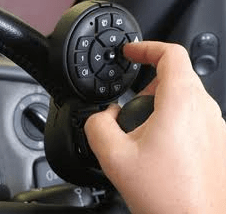 The steering aids range from a standard steering ball through to a steering aid that incorporates an infra-red system which allows the user to operate the auxiliary switches such as lights wipers of the vehicle from the steering aid. 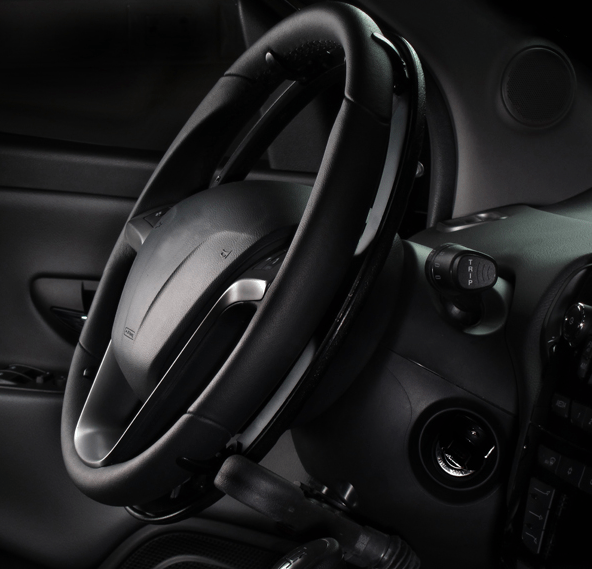 The steering aids can be used independently or in conjunction with driver hand controls. Brig-Ayd Controls Ltd is the manufacturer and suppliers of a range of quick release steering aids for use by disabled drivers. These steering aids can be used in conjunction with hand controls or on their own to aid the steering control of cars, vans, and trucks. 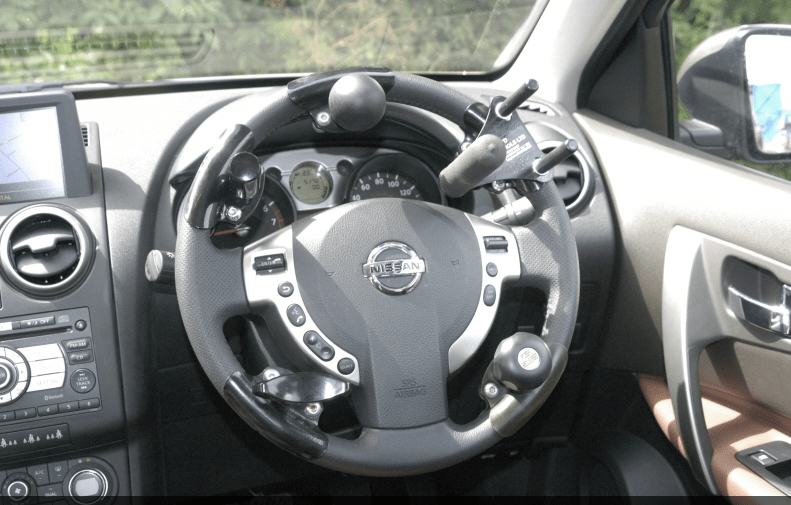 The design incorporates a simple to use release mechanism that can be operated with one hand to remove or refit the handle section of the device to the steering wheel. They are designed to fit modern wheels and do not affect the operation of the vehicle’s airbag. 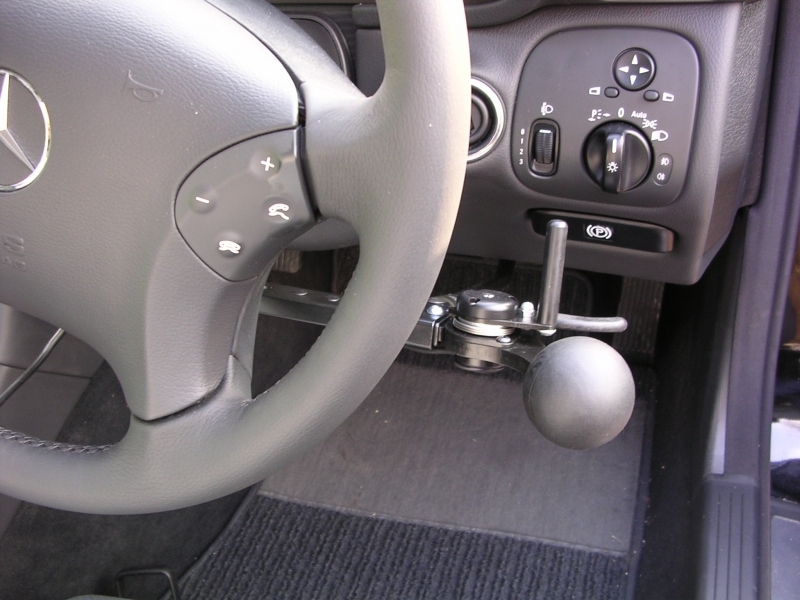 These steering knobs come with a range of grips such as a ball, mushroom, tee, and peg. For drivers with a higher level of physical disability, a variety of high-tech adaptations are now available which include joysticks for braking and accelerating. The Autoadapt swivel base in conjunction with the original vehicle seat. It can also be used with the BEV, Compact and Recaro seat. The swivel comes as either manual or electrical operation. The Turnout is a swivel seat designed for those who find it difficult to enter a vehicle or make a transfer from the wheelchair. Installed as a layer between the vehicle’s floor and the car seat the Turnout enables the car seat to be rotated facing outwards. The carolift 40 Boot Hoist is suitable for most standard self-propelling wheelchairs. The flexible elbow joint on the boom allows the user to lift the wheelchair from the pavement and by bending the boom allow the wheelchair to be put into a narrow boot opening. The carolift can then be stored by lying the hoist down or by making it quick release. 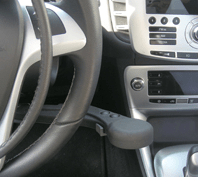 This entry was posted in aids for daily living, Car Adaptation and tagged adaptive vehicle devices, Disabled Drivers, Driving, Hand Controls, Passenger adaptations by Sean Loughran. Bookmark the permalink. Hello, I have a 16 year old daughter who is learning to drive and needs some adaptive equipment. She is having a difficult time using the shifter between the seats. It is a Subaru Impreza and the button on the front side of the shifter, would you have any suggestions on what we could do for her? 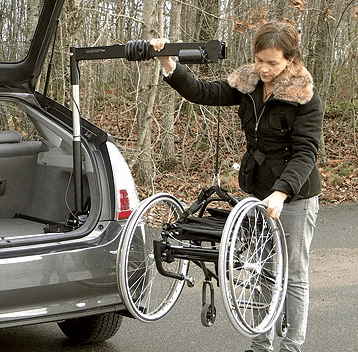 There are various hoists available to store a wheelchair within your car, in the car boot/trunk http://caradaptations.co.uk/adaptations/lifting-scooters-and-wheelchairs/boot-hoists and within a roof box on top of your car or van http://www.rica.org.uk/content/stowing-wheelchair-boot-or-roof. You should try and take your van to a company that does mobility car adaptations. In Ireland a few examples are OC Cars & Mobility Ltd, Motability Ireland Ltd and Par Fit Limited. If your not within Ireland try doing a search for mobility car adaptations within your area.